Now that Pennsylvania Avenue's partially separated two-way bike lanes are officially open in DC it's time to take a look at the two way cycle track on Dunsmuir St in Vancouver, BC. There are some pretty innovative features that makes this cycle track worth more than just a mention. The raised pavement bus stop shown at 2:02 is something that can help address SEPTA's objection to bike facilities on bus routes (more on that in an upcoming post). 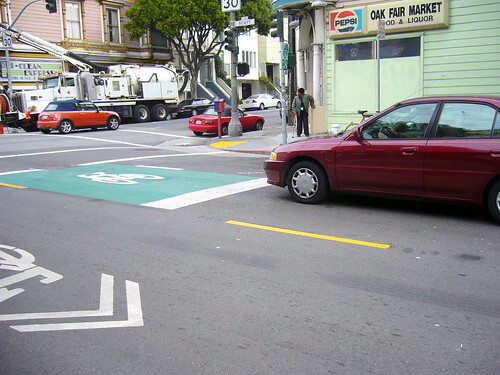 Perhaps the most relevant part of the video is at the 1:51 mark in the film that demonstrates how a cyclist can use a bike box to execute a left turn. Two way cycle tracks are tricky to design, it will be interesting to see how long it will take for drivers to adjust to the new traffic pattern. This video shows a problem with one of the unsignalized intersections. It's a gotcha moment for some vehicular cyclists, who might consider the 2 way cycle track a gold plated sidepath. But to us it looks likes a problem that can be mitigated. Furthermore it is also a case of not letting the perfect be the enemy of the good. 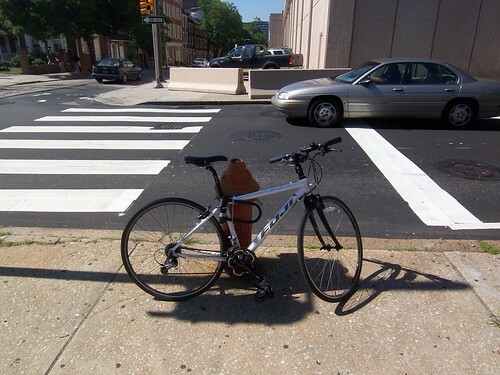 Getting back to the bike box, the City of Philadelphia now has a policy of recessing the stop bar 10 feet from the crosswalk at signalized intersections. 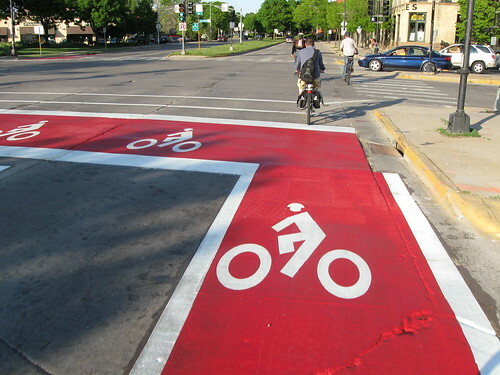 It seems that the Streets Department understands the difficulty that cyclists have at intersections but is skittish on the idea of a full blown bike box. 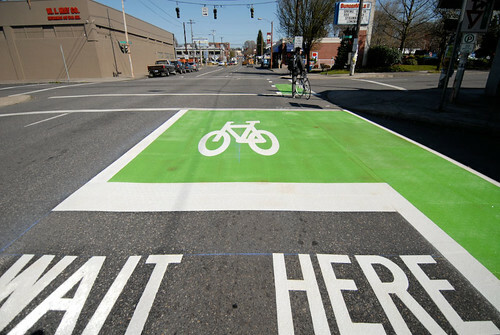 In the short term we support this as a good complete streets policy for intersections that do not any have formal bicycle facilities but the City needs to "just do it" and follow the lead of a growing number of cities from coast to coast that are putting in bike boxes. How about Walnut at 22nd for a first stab. But the worst increase was bicycle/pedestrian collisions as people exiting buses and trying to cross to the sidewalk were hit by bicycles. Bicycle collisions with pedestrians in general went up 88%, but went up 1951% for entering and existing bus passengers. Show me all the studies that you want, the fact is Copenhagen has dozens of miles of cycle-tracks. 44% of all rush hour trips are taken by bicycle (30X the rate of Philadelphia) yet in 2008 there were only 121 serious bike crash injuries and 5 deaths. Numbers that are very comparable with Philadelphia with its 1.6% bicycle mode share.